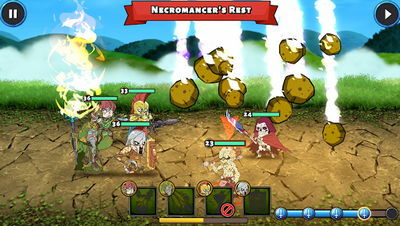 The game features 30 heroes of all types, and more than 70 powerful monsters to fight. Each hero has 9 skills and Soul Skill powers to blast the enemy with. And the monsters are also unique, including Bosses, with their own animations, stats, resistances, and special abilities. Are you ready to battle the world? then equip your best team of heroes and go head to head against other players in epic real-time multiplayer mode. Fight for the glory of your Guild and win powerful weapons and armor worthy of champions!